Unused steel H Beams & Cylinders available for sale. These Beams are manufactured by Tata Steel and available for inspection in Dubai. Serious buyers only. Please contact for more details. We are leading structural steel distributor and processing company. Established in 1993, Fuxin Steel is one of China's first imported H beam(UB/UC) DISTRIBUTORS. Since 1998, when MASTEEL rolled the first H-BEAM in china, Fuxin steel became its sole distribution agent in Shandong Province. After a decade of growing, as a designated distributor of main structual steel mills China, the company delivers over two hundred thousand tons of steels to customers annually. With the company's own processing centre, the company aims to provide our best service and products to our customers. HaijunSteel is a subsidiary of Rizhao Haijun International Group Co., Ltd. Our H beam steel production line can produce HW, HM, HN specifications of the three series of 19 H-beam steel and 1.3 million tons of flange bean, of which H192x198 light-gauge steel section. Economic rationality of H beam cross section sizes, good mechanical properties, rolling cross-section extends over all the points on a uniform, internal stress is small, compared with the ordinary I-beam, with a large section modulus, light weight, advantages of saving metal, it can reduce 30-40% weight of the building structure; Because of its parallel inner and outer legs, leg-side is the right angles, assembled into composite components, saving welding, riveting work amounted to 25%. Commonly used in the large bearing capacity required, good Cross-section stability of building (such as factories, high-rise buildings, etc. ), as well as bridges, ships, handling equipment£¬equipment foundation, frame£¬and foundation piles. Hot-rolled H section steel is mainly used in industrial plants, civil construction, municipal works, oil platforms, bridges, flatbed beams, power bracket of electrified railway and steel railway bridges. Lightweight, ultra-light H beam is ideal for containers, mobile housing bracket, various venues, villa manufacturing. (China steel manufacturer) HaijunSteel(haigroup AT haijunsteel DOT com) is professional manufacturer and exporter of steel products in China. Our H beam steel production line can produce HW, HM, HN specifications of the three series of 19 H-beam steel and 1.3 million tons of flange bean, of which H192x198 light-gauge steel section. Economic rationality of H beam cross section sizes, good mechanical properties, rolling cross-section extends over all the points on a uniform, internal stress is small, compared with the ordinary I-beam, with a large section modulus, light weight, advantages of saving metal, it can reduce 30-40% weight of the building structure; Because of its parallel inner and outer legs, leg-side is the right angles, assembled into composite components, saving welding, riveting work amounted to 25%. Commonly used in the large bearing capacity required, good Cross-section stability of building (such as factories, high-rise buildings, etc. ), as well as bridges, ships, handling equipment, equipment foundation, frame,and foundation piles. Hot-rolled H section steel is mainly used in industrial plants, civil construction, municipal works, oil platforms, bridges, flatbed beams, power bracket of electrified railway and steel railway bridges. Lightweight, ultra-light H beam is ideal for containers, mobile housing bracket, various venues, villa manufacturing. Standard packing,In bundle or bulk. H beam is developed and optimized from I beam, a kind of economical profiled steel with a better mechanics capabilities. The web plates and the flanges are in plumb. large-scale building requiring large carrying capacity and good stability (e.g. high-rise building, workshop etc. ), bridge, shipbuilding, crane, machinery foundation, trestle and foundation pile. Short on time? Let h-beam sellers contact you. H-beam 20 Length: 1.9m-5.9m Standard size:20cm(height)x8cm(width)x4cm(flange thickness)x27mm(web thickness) Flange: sawed-pine or spruce, Web: birch or poplar or larch plywood as web. Treated by wbp glue exterior used weather &water-proof coated by antiseptic & water-proof yellow painting. The Production Line Concludes: Nc Cutting Machine, H Beam Assembly Machine, H Steel Gantry Automatic Welding Machine Or Dual Cantilever Automatic Welding Machine, H Beam Flange Straightening Machine, H Beam Shot Blasting Machine Equipment. Production For Standalone Operation, The Workpiece Transporter Rely Crane Lifting, The Entire Line Is Relatively Flexible, You Can Add A Different Segment Of The Process Equipment To Improve Production Efficiency. H Steel Assembling Machine Specifications: Dimension Of Web PlateHeight200-1200mm Thickness6-32mm Length4000-15000mm Dimension Of Wing PlateWidth200-600mm Thickness6-40mm Length4000-15000mm Assembling Speed500-1200mm Installed Power7.5kw, Exclusive Of Welding Power Supply Transmission Speed0.5-6.0 M/min H Steel Door Type Submerged Arc Welding Specification: Dimension Of Applied H SteelWidth200~800mm Height200~1200mm Length2000~12000mm Diameter Of Applied Welding Wire3.2~5mm Positioning Speed3000mm/min Welding Speed250~750mm/min Gauge4000mm H Steel Flange Leveling Machine Specification: Width Of FlangeThickness Of FlangeMin. Height Of FormerLeveling SpeedPower Supply 200-800mm6-40mm200mm9000mm/minAc380v50hz In Wooden Case, Plastic Paper Or Wrapped With Film. 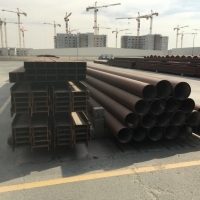 Size:100*100-900*300 Length:12m or as required Standard:GB,JIS,ASTM Material: Q235B/Q345B, SS400/SM490, S235,S275 Technology:hot rolled Brand:MASTEEL,Laiwu Steel Place of origin:Ma Anshan,China; Laiwu,China Delivery:30 days after receipt of order. In bundle.